Networking education through regional and interregional cooperation enables a more effective use of educational resources. Good practices, experiences and lessons learned can be shared through meaningful regional and interregional cooperation. The IAEA promotes partnerships among nuclear education and training institutions across the globe. Collaboration within and among educational networks contributes to the promotion, management and preservation of nuclear knowledge, and helps to ensure that talented and qualified human resources are available for the safe and sustainable use of nuclear technology. 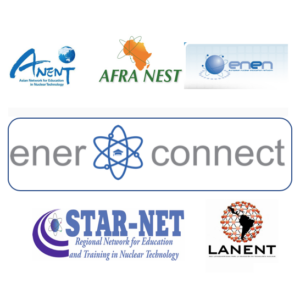 Following to the Collaboration Agreement among regional educational networks AFRA-NEST, ANENT, ENEN, LANENT and STAR-NET the Ener-connect has been established (https://www.ener-connect.com) which consist of academics, scientists, and engineers interested in the peaceful use of nuclear energy. The Ener-connect goal is to create collaborative opportunities between researchers, academics, and students in Europe and their peers in Africa, Asia, Eurasia, Latin America, and the Middle East. In order to reach this goal a number of webinars was organized by Ener-connect in 2018-2019 on different aspects of the peaceful applications of nuclear science and technology. On March 27, 2019 the webinar was devoted to the safety in Russian nuclear power plants – speaker was Professor Aleksandr Nakhabov, who is an associate professor of Nuclear Physics and Engineering Department and Head of Department of International Education and Collaboration at the Obninsk Institute for Nuclear Power Engineering of the National Research Nuclear University MEPhI in Russia – a member of STAR-NET. The webinar focused on Russian nuclear power plant (NPP) safety design features and technologies, with special focus on the Russian VVER-1200 design. Internet links to watch a recording of the webinar and download a copy of the presentation are below. The webinar was attended by participants from Austria, Argentina, Armenia, Belarus, Belgium, Bolivia, Cameroon, Egypt, Finland, France, Germany, Ghana, Italy, India, Japan, Jordan, Kenya, Mongolia, Morocco, Nigeria, Philippines, Russia, South Africa, Sri Lanka, Sweden, Switzerland, Ukraine, United Kingdom, United States, Venezuela, Vietnam, and Zambia. These participants were scientists, regulators, and academics who asked a lot of questions and provided the positive responses on the webinar series. Ener-connect is planning more webinars, a podcast series, and other virtual tools to help promote connections and support collaborative efforts. You can watch the webinar presentation here. You can download Professor Nakhabov’s presentation here.